A crazy idea came to me on the train taking me to the 2016 White Horse Samhain (Hallowe'en) Camp, held at the Wild Ways crafts and retreat centre in Shropshire, UK. Having seen the already full schedule of events planned for the camp, I had felt there might not be anything I could add to it. 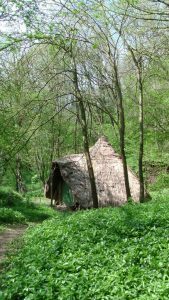 For years, however, I had pondered the possibility of holding an all-night ceremony in the Iron Age roundhouse (right) we had built in nearby woods. I thought perhaps this might fit in as it wouldn’t start until everything else had finished, running through until sunrise the following morning, Sunday, November 30th. People would be welcome to come and go whenever they chose to or needed to. Even so, it was a bit of a cheek to arrive out of the blue with this crazy notion without having discussed it with any of the organisers beforehand. However, one of the great things about White Horse camps is the openness of the organisers to the unexpected and strange and their willingness to make room for them. These threads all came together through a Lakota prophecy that a Black Snake would come to devastate their land, causing people and animals sicken and die. 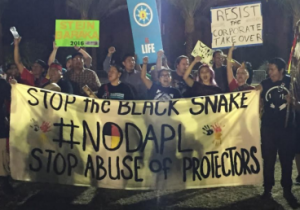 Many Lakota see the DAPL oil pipeline as that Black Snake and, therefore, see opposition to it as both a vital necessity and a sacred duty. I had already been led to the conclusion that individual healing in our Druid tradition comes about partly through invoking the power of a White Serpent of Healing to set against the power of a Black Serpent that brings disease. My thinking for this roundhouse ceremony was to try to harness the power of the White Serpent to oppose the DAPL Black Snake and as many other manifestations of its destructive force in the world as we could fit into one long night. The ceremony was duly announced to the camp at the first morning meeting, for which I particularly thank Richard and his fellow organisers, Ariane and Hilde. As we wouldn’t be starting until around 11pm at the end of a full day, and would continue until sunrise at 6.50am, I had no idea whether anyone would want to come at all, let alone how many. However, a few friends immediately expressed not only interest but excitement, so there were willing helpers to join me in transporting things to the roundhouse and preparing it. Thanks to Becky, who wields a fine besom, to Amanda, Daru, and Elaine, who not only runs the centre but loaned us two large reindeer hides, some saining sticks and a couple of warm woollen blankets from her house. When I mentioned our intentions for the ceremony on the BDO Facebook page, people in countries around the world said they would join us in ceremonies timed to coincide with ours. This was a wonderful gift and a further inspiration to us. Thank you friends, heart to heart, spirit to spirit. Adding to an already potentially rich mix, Elaine also donated a bag of Chaga, a remarkable medicinal plant, a hard, woody fungus that grows on Birch trees in Northern climes. This had been given to her by a remarkable couple, Morten Wolf Storeide and Louise Degotte. 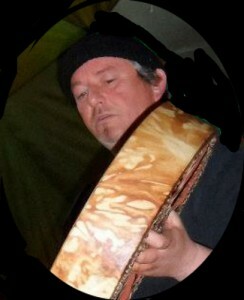 Morten organises the global travels of The World Drum, a powerful healing Drum made by a Sami drum-maker following the vision of Kyrre Franck White Cougar. 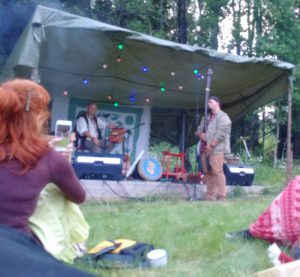 Morten and Kyrre, with their friends, LeNa Paalvig Johnson and Will Rubach, brought us the gift of an amazing ceremony centred around Chaga when we hosted The World Drum at Wild Ways in 2013. For use in ceremony, Chaga needs to be brewed for at least four hours. This meant that a few of us had to miss the Saturday evening eisteddfod and go to the roundhouse shortly after 7pm to begin the brewing process. Amanda, who had taken part in an initiation in the roundhouse, stayed on to set up the tripods over the central fire to support the two pots in which we would brew the Chaga. The water was already heating when I arrived. We sat and talked for a while as we waited for it to boil. Then we began adding Chaga, taking it in turns to put a handful into the two pots and stir them. We talked through ideas about what we might do during the ceremony and the Chaga crew came up with several ideas while helping my sketchy ones to take shape. For the rest, I was relying on the spirits to guide us, and on all those who came, both seen and unseen, to bring their own inspiration and ideas to the mix. A few more people drifted in after a while, followed by quite a crowd once the eisteddfod ended. Having doubted whether anyone would come, we found the 20 log seats we’d set out were not enough. Of the 55 people on the camp, about 25 joined us. 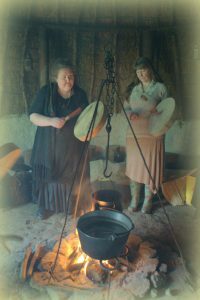 As for how we were going to work, I thought we might do some personal healing, using a technique I developed, or rediscovered, while researching for the British Druid Order ovate course. I felt we should drum and chant for the animals. I already have a Wolf chant (naturally), and a Deer chant, and thought we could come up with something for the Badgers. I also knew we had to work with the power of the White Serpent, though I wasn’t sure how. Again, I trusted the spirits to show us the way. The fact that we were working through Saturday night into Sunday morning, and that Sunday 30th was the day of the New Moon of Samhain, helped. Samhain (‘Summer’s End’) is the old Irish name for the seasonal festival known in Wales as Nos Galan Gaeaf (‘Nights of Winter Calends’) and in England as Hallowe’en (‘Hallowed, i.e. Sacred, Evening’). Originally held over three nights, it marks the end of summer and the beginning of winter. The Moon has its own serpentine associations, its nightly waning from the full being likened to a snake shedding its skin. A snake within a Moon appears on many Celtic coins, as in the top left corner of this image from our Druid Tarot deck, taken from one of those coins. It struck me very strongly that the New Moon of Samhain would be exactly the time at which the White Serpent would go down into the earth, as the leaves were falling from the trees and the last of the wild plants dying back into dormancy. 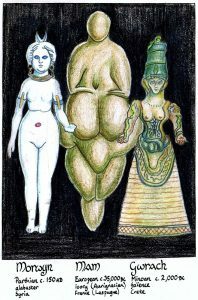 This phase of the year’s cycle is reflected in, among others, the Greek myth of Persephone, and the ancient Middle Eastern legend of Inanna’s descent into the underworld. 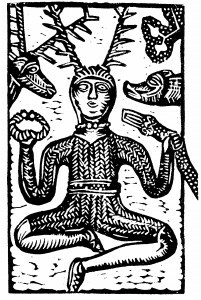 In native British lore, the goddess who possesses the serpent power appears as Olwen of the White Track, daughter of the giant, Ysbaddaden (‘Hawthorn’), as Creiddylad, daughter of Lludd (or Nudd) of the Silver Hand, and as Arthur’s queen Gwenhwyfar, whose name means ‘White Enchantress.’ All of these three feature in the archaic tale of Culhwch and Olwen, as preserved in the 12th century collection of tales known as the Mabinogi. The night of our working, then, was the last during which our Serpent Goddess’s power would remain above the earth prior to its descent into the underworld where it would spend the winter. This seemed the perfect time to invoke her aid. In our ceremony, then, we invoked the healing power of the White Serpent against the destructive power of the Black Snake. I think it was Ariane who drew our attention to the fact that Ineos, one of the companies involved in fracking in the UK are calling their fleet of huge, Chinese-built oil tankers ‘Dragon ships.’ Is this a deliberate invocation of Black Snake energy on their part? Who knows? The insidious way in which oil companies and governments are conspiring together to force the unwanted, unnecessary and polluting technology of fracking on unwilling populations around the world is symptomatic of a wider malaise in which democracy has long ceased to be what it was in pagan Greece, i.e. ‘people power,’ becoming instead a means by which wealthy and powerful elites retain dominance over increasingly powerless populations. Polls show that 81% of the UK population would like to see more investment in renewable energy sources, while only 19% favour fracking. 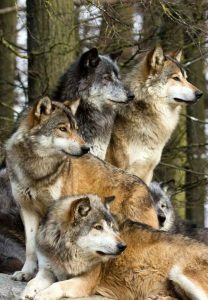 In Norway, there is an identical split between the majority who want to see Wolf numbers remain the same or increase and the minority who want them killed. Meanwhile, polls in the USA show that 86% of the population are with the protectors at Standing Rock and against the DAPL pipeline. Fortunately for us, this huge public support for what we were trying to achieve through our ceremony meant that there was a huge impetus behind us. Trying to work magic against opposition is hard. It's easier if the vast majority of the people of the world are with you in spirit. Knowing that they are is encouraging, to say the least. One of our group brought a flag bearing the symbol of the Pagan anti-fracking movement in the UK and we lodged it into the rafters of the roundhouse, where it stayed throughout our ceremony. I'm not sure what it was originally designed to represent, but to me it looks like a Dragon's head! We drummed to raise energy for ourselves and the groups and causes we had been asked to pray for and send power and healing to. As with the people at Standing Rock, we directed some of those prayers towards those causing the harm, asking that they realise that what they are doing is destructive and wrong, and that it is in their long-term interests to change. Long ago, in talking with spirit workers from other cultures and traditions, there emerged a strong sense that we should be working together for our shared Great Mother Earth and all her children. Subsequent meetings with healers and fellow spirit workers have strengthened this sense that now is the time for us to set aside the surface differences that divide us and recognise the commonalities that we share. As spirit workers, we regularly work with altered states of consciousness, and so are ideally placed to work towards changing the consciousness of those who seek to despoil and pollute our planet, bringing them to the light of realisation and understanding that will lead them to change what they are doing for the benefit of all. 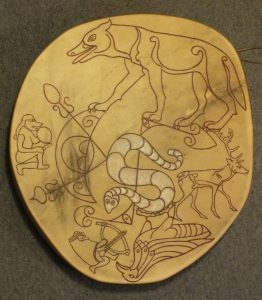 We cast our circle with sound and saining herbs, we invoked into it all those powers for good that we work with, the spirits of place, the elemental spirits and guardians of the four directions, of our ancestors of blood and spirit, of the old gods of our lands, and of the White Serpent of healing (as painted on my drum, right) and the Dragon power through which it also manifests. We chanted the Awen, the holy spirit of inspiration and creativity. We shared Chaga brewed on our sacred fire. We drummed and chanted long into the night. From around 2am, people began to drift away, thanking our ancestors as they passed across the threshold and went in search of sleep. By around 3.30am, our numbers were reduced to around nine, of whom eight were lying on the piles of furs we had provided or on the bare earth floor, most under blankets. While they drifted in and out of sleep, I continued to quietly drum and chant. I had thought to go into trance with the drum, but this didn’t happen. I realised that my role was to drum for the others, both seen and unseen, in the roundhouse and around the world. Between drumming, I made sure the central fire was kept fed with logs. My lone drumming vigil continued until around 6.30am, at which time, without prompting from me, the others began to stir, wake up, and reach for their drums. We formed a circle around the central fire, linked hands and chanted the Awen again. Then we began to drum the sunrise, beginning quietly and building to a thundering crescendo that carried us across the moment of dawn and into the light of a new day, the day of the New Moon, blessed by the White Serpent of Healing. 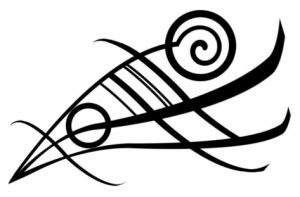 I shared a gift of insight the Awen had given me during the night; the reason why our ancestors were called Nadredd. As Druids, we are the Serpent, we are the Power, we are the Dragon. Our role is to embody the Serpent Power, to carry it within us at all times, to use it for the benefit of our communities, our Great Mother Earth and all her children. When the White Serpent Power of the Goddess of Life, Light and Healing goes down into the earth for the long Winter months, we, as Druids, continue to embody it in the world so that the light of life never dies. I am a serpent; I am reverence, that is an open receptacle..."
Profound thanks to all who made our ceremony possible and took part in, both seen and unseen, in the roundhouse and around the world. Thanks to the spirits of place, spirit animals, ancestors and old gods of our lands for their gifts of Awen, and thanks to the Serpent Power of Life, Light and Healing. May that power be with all who need it in these strange and troubled times. May the Light shine strong within you. Sunday May 1st 2016, Wild Ways Retreat & Crafts Centre, Highley, Shropshire. 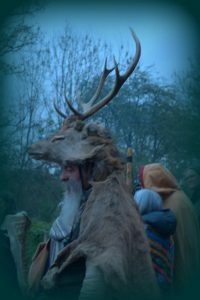 It started in 1974, the year I simultaneously discovered Druidry and shamanism and realised that classical Druids must have been the British and North-west European equivalent of shamans in other cultures. I sensed from the beginning that a vital feature of our tradition had been a strong spiritual bond between humans and animals. Twenty years later, I encountered my spirit animal brother in a sweat lodge. 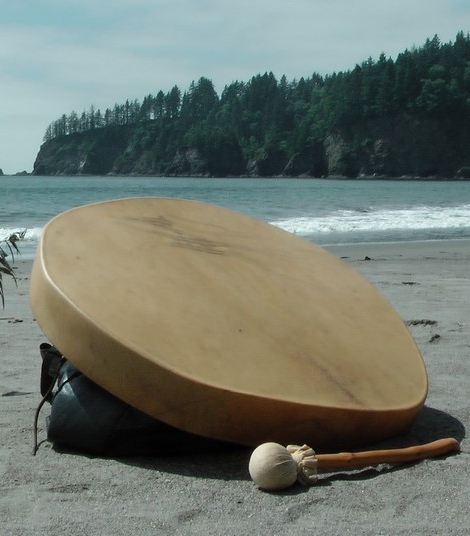 Ten years after that, I visited the Quileute people on the shores of the Olympic Peninsula and was honoured to be made a member of their drum circle. 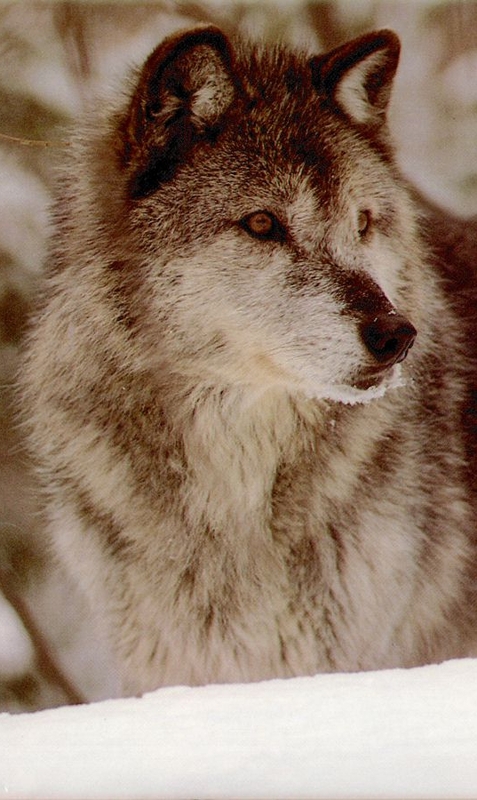 The Quileute are descended from shape-shifting wolves. Then, in 2013, four friends arrived from Norway for my 60th birthday party at the Wild Ways Retreat and Craft Centre in Shropshire. 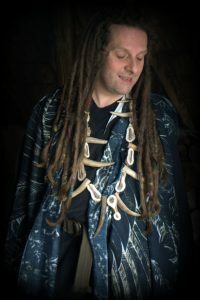 Kyrre Franck and Morten Wolf Storeide are core members of the World Drum Project and, with LeNa Paalvig Johnsen and Will Rubach, members of the shamanic band, Baalfolket, 'the People of Fire.' 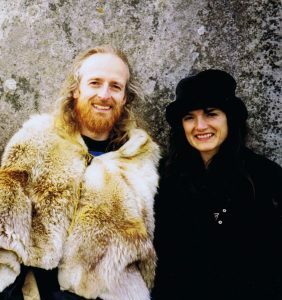 They brought with them an amazing ceremony, centred around a medicinal fungus called chaga, which grows on birch trees in cold, Northern climes. Among other things, chaga boosts the immune system, reduces stress levels, is used for a variety of stomach ailments and has anti-cancer properties. For use in sacred ceremony, it must be prepared over several hours. 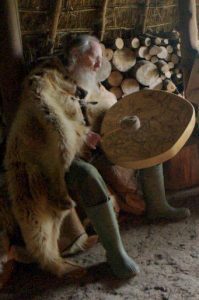 I joined our Norwegian friends in our Iron Age roundhouse for the preparation. We drummed and sang as the chaga brewed and Steve Rumelhart and I then acted as doorkeepers in one of the most powerful, beautiful, joyous ceremonies I've ever taken part in. When Barry Patterson asked me to do something for the White Horse Camps Beltaine celebration at Wild Ways this year, I agreed, if I could think of something genuinely worth doing, rather than just filling a slot in the schedule. It had to be of real, transformative value to the people attending, powerful and enriching of our tradition, and truly honouring of our ancestors. It was a long time coming. Eventually, another visit to the roundhouse gave the answer through a vision in which people in body paint, masks and animal hides burst through the doors, accompanied by Barry, wearing a full set of antlers and a blue cloak (right). So I knew there had to be a ceremony in the roundhouse involving animal guising. Then came the question of how to fully involve people in that ceremony. The single two-hour session originally intended then grew into four interlinked sessions that could also be experienced separately. 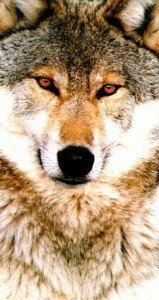 My encounter with my Wolf spirit in 1994 had completely transforming my spiritual practice. If I could bring some of the power of that experience to people at the camp, that would certainly be worthwhile. A journey to encounter spirit animals then, plus the animal guising, would fit perfectly with the theme of the camp which was to be the Wildwood. 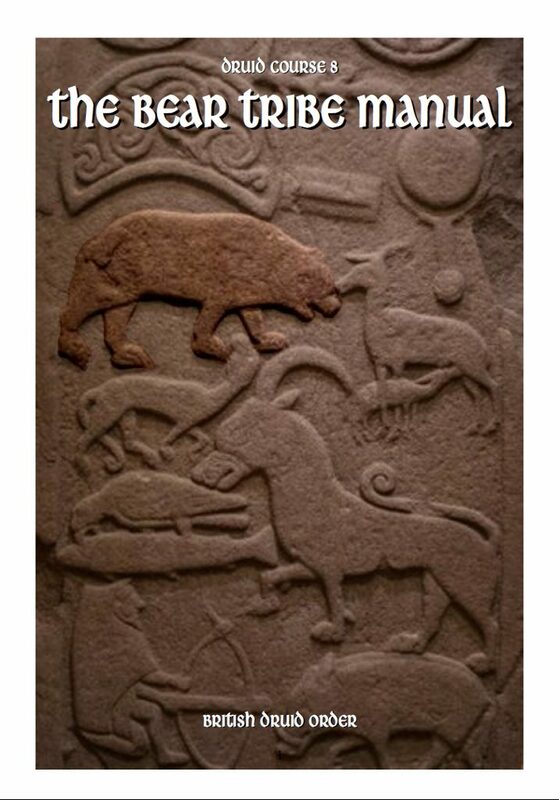 I could also bring to it some of the work I've been doing for the British Druid Order courses, researching and writing about spirit animals and how our ancestors have understood and worked with them over the last 40,000 years. 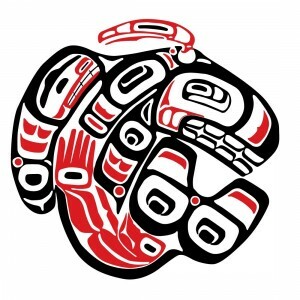 The vision given to me in the roundhouse reminded me of traditional Pacific North-western ceremonial societies, including the Quileute Wolf Warrior Society. Like many indigenous ceremonies, those of the Quileute societies performed many functions. 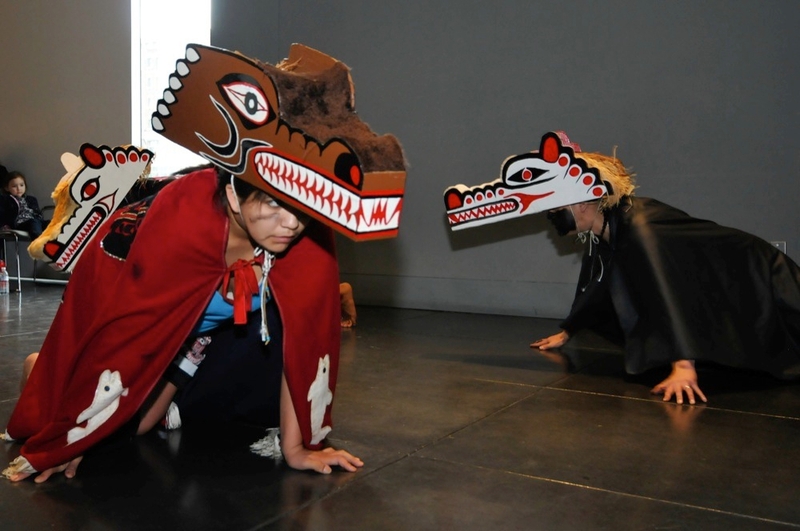 Quileute dancers wearing Wolf masks, from a public dance held in 2011. They were communal celebrations as well as offering healing and transformation for individuals, all things I wanted our ceremony to achieve. I realised early on that my connection with the Quileute nation has a purpose meant to be beneficial for all in ways I don't yet fully understand. 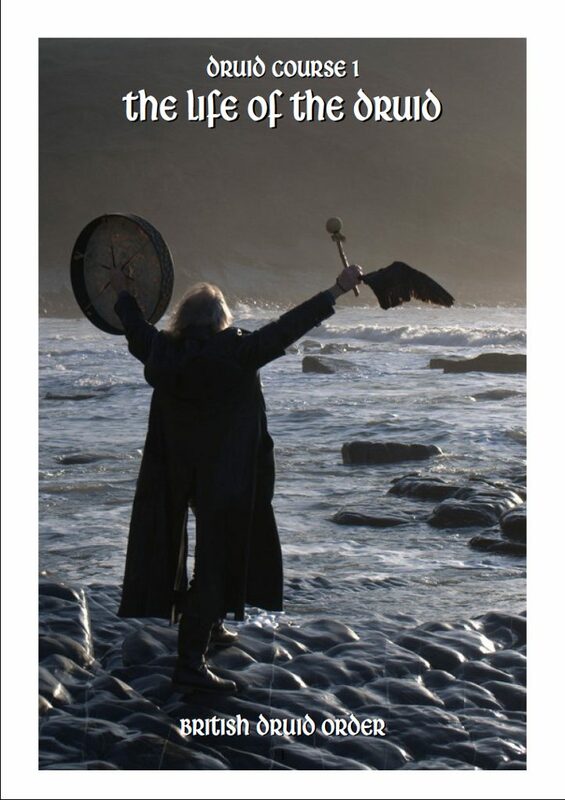 I believe part of it is to help us, as British Druids, to restore lost aspects of our own native traditions. Knowledge of the Quileute ceremonial societies prompted me to look for evidence of similar societies among our own ancestors. 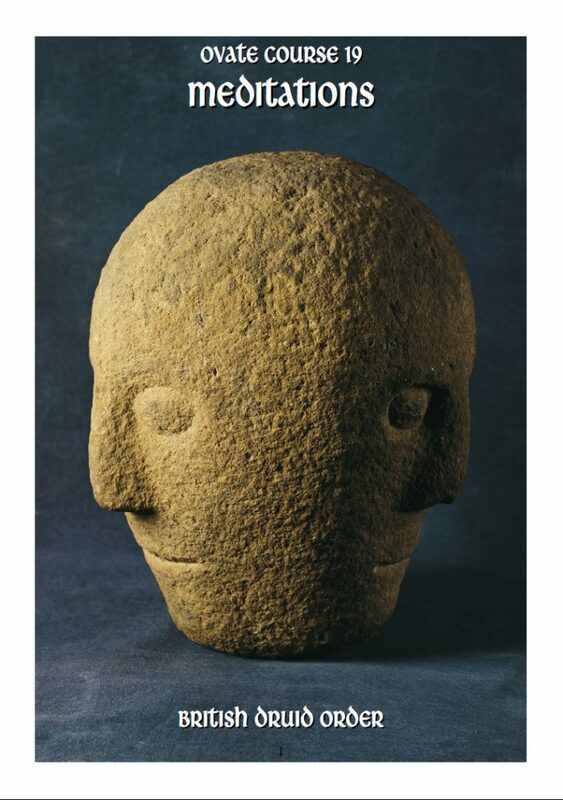 That evidence exists and is compelling, from Central Asia, to Vedic India and pagan Europe to early medieval Ireland. The ceremony shown to me in vision suggested another way in which we might begin a process of re-connection with another lost aspect of our ancestral heritage. 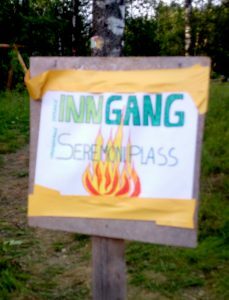 It took a lot of organising and the dedicated assistance of many people, beginning with Morten, who gave us enough chaga for two cups for fifty people, gathered near his house in the forests of Eastern Norway. Morten sees chaga (left) as a sacred gift from Mother Earth to be shared with those who need it and will use it well. Next was Elaine Gregory, who co-runs Wild Ways with her partner, Garth Reynolds. She was unfailingly supportive every step of the way. Then there was Barry, willing not only to allow me to run with my increasingly wild ideas but to actively participate in them in a leading role, a role I forgot I hadn't told him about on the usual planes of existence, but we communicated so well in spirit that he already knew, so that was good. In the event, all our efforts came to beautiful fruition. I arrived a week before the camp was due to start, much of which was was spent cleaning and arranging the roundhouse, making sure it would accommodate the expected fifty people, stocking up its wood supply, clearing the area around it and rigging a temporary tarpaulin shelter in case of rain, assisted by Elaine. We took down a cauldron and a large cooking pot. As ever, I spoke with the spirits of the place and made small offerings to them. 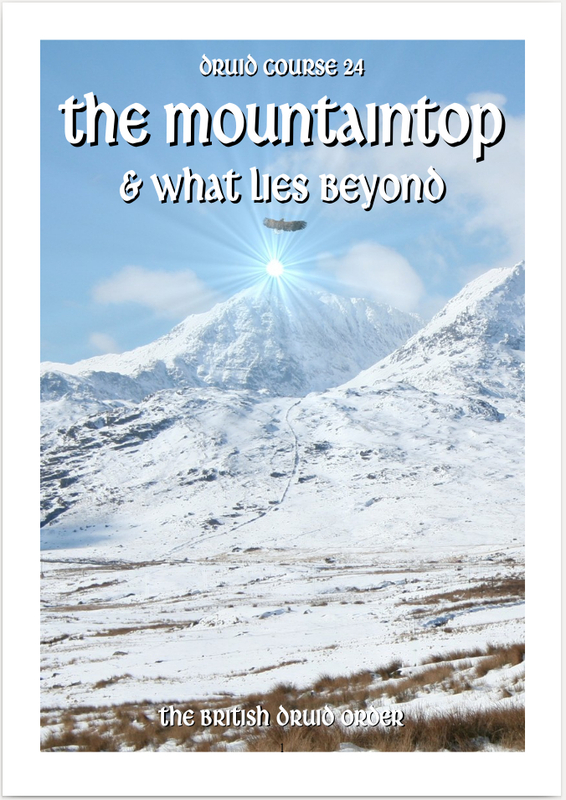 This was followed by the Otherworld journey in search of spirit animals, for which I drummed. As it happened, most people on the camp already knew their spirit animals, but some had not encountered them in the Otherworld, some took the opportunity to check in with them, others undertook the journey for other reasons. The few newcomers were in uncharted territory. This being the last event of the evening, I hoped it would create or renew links between people and their spirit animals which would then continue to 'brew' overnight in dreams and visions, preparing people well for the transformation they would engage in in the woods next day. The fact that so many people did know their spirit animal or animals was interesting. If you'd asked the same question twenty years ago, when we started holding Druid camps, few would have known. Another measure of how much Druidry has changed, and how rapid those changes have been. On May Day morning, having reminded everyone that there was to be no photography during the animal guising or the following ceremony, and that it was to be an alcohol free and caffeine free day, because neither work well with chaga (it was, in any case, an alcohol free camp), our Chaga Crew set off for the roundhouse shortly before 11 am. 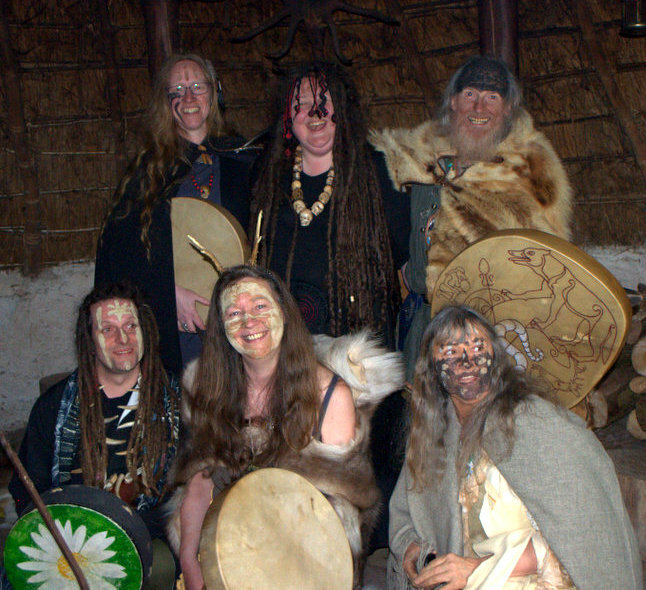 The Crew was largely recruited at the last minute from the ranks of campers and consisted of Amanda Foale-Hart, a great and loving soul I'd seen in action in ceremony many times; Paul Beer, remembered from our World Drum gathering at Cae Mabon in North Wales; Hilde Liesens, who took a central role in our Midwinter ceremony a couple of years ago; and Ariana Power, who was so keen to be a part of the team I just couldn't refuse; Elaine and myself. Never having worked together as a group before, I was a little apprehensive as to how we would jell for what needed to be done. I decided to trust in the spirits. It was a good choice. Our job for the next several hours was to oversee the brewing of the chaga, stirring into it all the magic we could muster between us. Part of this process was to come together as a group and discover what we were going to do during the ceremony itself. Our first task, though, was to get the fire going. A couple of bits of log from the previous night were still glowing, so we began blowing dragonwise, as only Druids can. We blew and blew and took it in turns to blow, and eventually fire sprang into being. Building up a cone of sticks we soon had a good blaze going. There's a real art to building fires in roundhouses so that they don't smoke too much. Part of it is using very dry wood, another is maintaining a cone shape so that the wood catches quickly and burns brightly rather than smouldering for a while before catching. 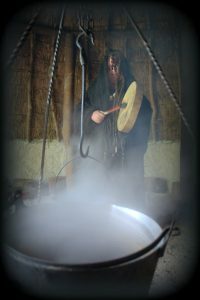 We filled our cauldron and big pan with water, hooking the former on a chain suspended from a wrought iron tripod and standing the latter on a horseshoe trivet. We then waited for them to boil. With so much water in them, even with a good fire directly underneath, this took a while. As we waited, we talked about what we were going to do when folks arrived and drummed together for the first time, tentatively at first but with growing confidence. Ghillie Dhu, 'The Dark Lad,' by Brian Froud. I talked a bit about chaga and our native spirit of the birch tree, on which the chaga fungus grows. In Scotland, he is known as Ghillie Du (pronounced Gilly Doo), 'the Dark Lad.' In Welsh, that's Hogyn Ddu (pronounced Hogun Thee). He is a friendly, helpful spirit, small and wiry with tangled black hair, dressed in birch bark, leaves and moss. If you come across him when you genuinely need help, he will help you. If you try to find him for the wrong reasons, you will fail. I also revealed the name and identity of the roundhouse's deer spirit guardian, something I rarely do. The cauldron, being smaller, boiled first, noisily boiling over, causing hands to quickly reach in and pull it away from the fire. I reduced the level of the fire and we returned the cauldron to its place. Once the big pan was also boiling, we began adding chaga, each of us putting two handfuls into the big pan and one into the cauldron, adding more until we'd used the whole bag. We took it in turns to stir the brew with the hazel stirring stick I'd made, into which John Whittleston had burned the Ogham letters for Birch and Hazel. And so the brewing began. We continued to drum and sing. I suggested a few chants we might do, including, in view of the powerful deer energy in the place, my native British Deer chant. Of course, I couldn't resist adding my Wolf chant too, excused by the fact that many of those attending the ceremony would first have spent time in the woods being their spirit animals. Paul started to drum and Amanda began to chant the word chaga. The rest of us joined in and a rhythmic chant soon evolved that sounded good and felt as though it had power. 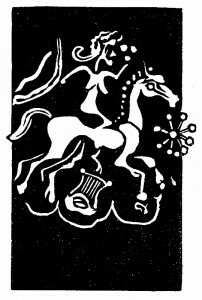 Another time, Paul started drumming and chanting the name of the Birch spirit, Hogyn Ddu, which morphed into “Come to me, Hogyn Ddu,” to which I added, “Hogyn Ddu, Hogyn Ddu, spirit of the great Birch tree.” More chaga, more stirring. I started a beat that fit with the name of our deer spirit guardian and we began to chant his name. After a while, I started improvising calls over the chant such as, “I hear your hoof-beats thunder through the forest, I hear your hoof-beats coming to our circle, I hear your hoof-beats dancing in our circle...” By the time the first people arrived at the roundhouse for the ceremony at 3.45 pm, we had quite a repertoire of chants ready. While we conjured, sang and stirred inside the roundhouse, other things were happening outside. Barry shepherded about thirty people to the log store at the back of the roundhouse where we had provided body-paints Elaine and I had made from charcoal from our fires and coloured clays dug from the land. Some opted to go naked apart from body-paint. Others donned animal hides and masks on top of face and body-paint. Some wore ragged clothing of leather or wool. Once their spirit animal guise was complete, Barry led them into becoming their animals, after which they ran off into the woods. There was a boar, a horse, fox, raven and various other creatures among the guisers, even a chameleon and a hedgehog. They snuffled among bluebells, climbed trees or trotted along paths, according to their nature. A dozen or so early arrivals who had opted not to do the animal guising saw some of the animals in the woods as they made their way along the deer path to the roundhouse. We opened the doors to them and they were sained and blessed by Elaine and Hilde, our doorkeepers for the night, who marked their foreheads with an awen symbol. They were then welcomed in and shown to their seats. Saining is a native tradition of purifying and sanctifying with smoking herbs, leaves or strips of animal hide. We used a saining stick made from St. John's Wort (left) and Meadowsweet. 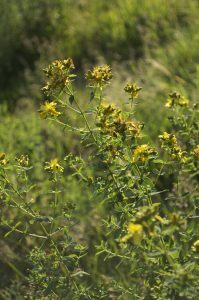 St. John's Wort is a protective and cleansing herb with a very long history of magical use. Meadowsweet is one of the ingredients from which the enchanters, Math and Gwydion, create the maiden, Blodeuwedd ('Flower Face') as a May bride for the young god of light, Lleu Llaw Gyffes in the Branch of the Mabinogi called Math, son of Mathonwy. About ten minutes later, we heard the yowls, growls and howls of many animals outside, racing around the roundhouse while Barry's bagpipes skirled them on. A bang on the doors, we flung them open, and in charged thirty or so wild animals. They cavorted, leapt and crawled around the roundhouse interior, shrieking, screaming, grunting, howling, eyes wide and wild. It was an amazingly impressive entrance, exceeding my wildest expectations. To enhance the sense of natural chaos, the Chaga Crew drummed wildly. Barry entered amongst the untamed ones, ducking low so that his antlers wouldn't catch on the roof, wearing his full red deer hide and head (known as Donald), and my dark blue cloak underneath. The scene exactly mirrored what I'd seen in my vision. It was a wild, wonderful, magical moment. Following the rampage, the animal folk exited the roundhouse. Once outside, they reverted to more human form before re-entering, carrying cups for the chaga. As they came in, each was sained and blessed. After the last person was admitted, the doorkeeper's role reverted to guarding the doors against any unhelpful spirits who might try to get in. When you're doing powerful magical work, good spirits are attracted to it, but more tricky ones sometimes also try to get in, hence the need for doorkeepers. Paul (left) ushered our new arrivals sunwise around the interior, pointing them to their seats. When everyone was seated, we began ladelling out the chaga brew into the cups they'd brought with them. I couldn't resist throwing in a little Mrs. Doyle impersonation (from Father Ted in case you were wondering), saying “Will you have a cup of chaga now? Ah, g'won, g'won' g'won, you know you want to.” Other Chaga Crew members joined in, and this set off Bee with a fit of giggles. It is in the nature of Bee that when she laughs, she finds it very hard to stop. She told me later that she forced herself to stop when it got too painful to continue. Her joyous, bubbling laughter spread around the circle and was a perfect start to our ceremony. The roundhouse is a perfect setting for ceremonies, not only inherently beautiful in a way that sings powerfully of our ancestors, but also interwoven now with seven years of ceremonial use and sliding between the worlds, and filled with good, strong, protective, guiding spirits. Such an environment tends to bring out the best in ritualists. Having realised how easy all our chants were to join in with, we encouraged everyone to do so. Then we began. At one point, while Ariana, Paul and Amanda were busy refilling cups with the sacred brew, I started idly tapping a gentle heartbeat rhythm on the drum and adding a wordless song. This was soon picked up and embroidered on by people around the circle so I kept drumming but stopped singing to listen to the sounds being woven by the group. 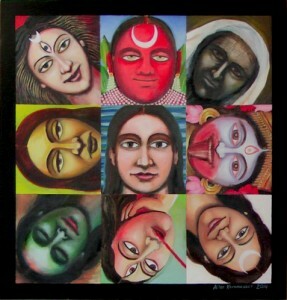 It was a rising, falling chant in which voices merged together and wove around each other in ever-evolving patterns. It was utterly beautiful. When it came to a natural end in silence, I was so moved the I was unable to speak for a few moments. I dubbed it the Song of the White Horse Tribe. We performed my wolf chant, giving folk the opportunity to howl along at the end. We ended with what was, at one time, the closing song of the Quileute Drum Circle. The chant presented perhaps the best singalong opportunity of the night, since pretty much everyone knows it. I shan't spoil it for you, in case you happen to run across one of our ceremonies. It's right to maintain a little mystery. When we were done, the roundhouse end everyone in it were buzzing with energy and joy. People got up, hugged each other, and began to filter out through the double doors. The ceremony complete, photography was allowed and Elaine got some great shots of blissed out smiling faces as folk emerged into the late afternoon light. There's a palpable sense of joy, wonder, and a kind of elevated calm produced by a chaga ceremony that it's hard to describe but beautiful to observe and to feel. 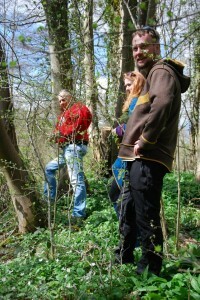 That's why the Chaga Crew are smiling so broadly in this photograph. We did a good job, folks, as did all those who attended. If you want it enough and put the work in, there's no reason life shouldn't always be this good. Smile on! People were so well attuned with their spirit animals by the work we did together over the first weekend that animal energy continued to flow through the rest of the week, being especially apparent during the lodges into which the camp divided mid-week. From my own point of view, I'd had the opportunity to test a type of ceremony that has several millennia of history behind it but that I'd not tried before. 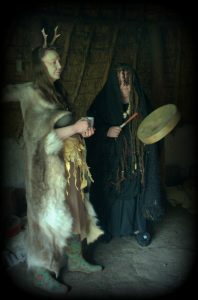 I was delighted with how well it worked and it will form the basis of ceremonies in the BDO Druid course. I've also been drinking chaga daily since the May Day ceremony in the roundhouse and am feeling physically, psychologically and spirititually better than I have done for years! 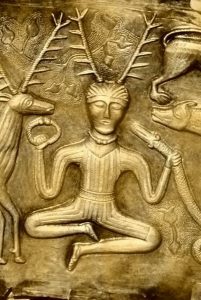 Ever since 1974, I've been trying to re-create the vision of Druidry that came to me then, a wild, animistic, magical, powerful image encapsulated for me in the antlered man portrayed on the Gundestrup cauldron (right). Over the years, I've come to call this process of re-creation 'rekindling the sacred fire.' The sweat lodge Wolf vision, the Quileute drum circle, building of the roundhouse, drum-making, creating ceremonies based on those of our ancestors, and sharing these things with others on the path, are all a part of this rekindling. This prophecy suggests that the Anishinabe, in common with many other indigenous peoples around the world, and in common with us as Druids, are in a period of recollection and restoration of ancestral ways. 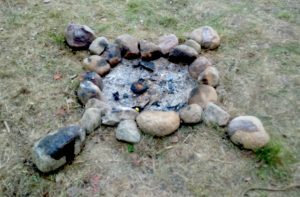 Part of my vision for Druidry is that we, having chosen the right road, may take our place around the sacred fires alongside folk of other indigenous cultures. Through a growing network of links, the process of rekindling has already begun. In coming together, we, the spirit workers of the world, may yet kindle that Eighth, eternal fire. Eagle shape-shifter. Bronze from Oxfordshire. The first stage in preparing a ceremony is to know its purpose. There's little point creating a ceremony just because it's that time of year, or there's a slot to fill at a camp, or someone's asked you to. There has to be a valid, spiritual imperative to it, otherwise there's no point. Ceremony should always be, first and foremost, a sacred act, rather than a theatrical performance or an historical re-enactment, although it may include elements of both these things. 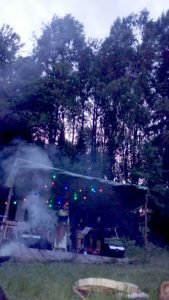 When I was asked to do something for the White Horse Beltaine camp at Wild Ways this year, it took me a long time to work out what to do and why to do it. 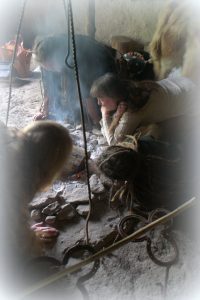 It wasn't until I visited Wild Ways again and sat in our Iron Age roundhouse that an answer came to me. As so often in that magical place, I slipped between worlds and had a vision. I saw a stream of people entering through the double doors. They were naked apart from animal hides, masks, face and body paint. They danced into the roundhouse and circulated around the central fire while I drummed along with three or four other drummers, all with frame drums. At the end of the line came Barry Patterson, wearing a dark blue cloak and a deer mask with a full set of antlers. Horse woman. 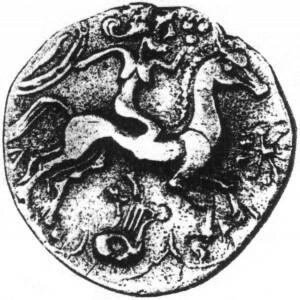 1st century Gaulish coin. Following this vision, what I felt it right to do on the camp came into focus. 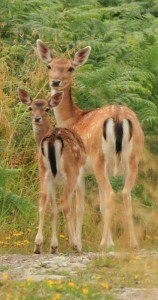 Central to it is our sacred relationship with the rest of animal life on our planet. This is, in itself, a complex web rather than a single relationship. 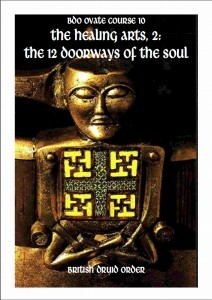 It is also a foundation stone of our spirituality. Not just Pagan spirituality either. The spiritual links that humans have had with other animals since the remote depths of prehistory underlie all religions. For our pagan ancestors, and for many modern indigenous peoples, animals were/are models of strength, speed, intelligence, kinship bonding, hunting ability, and spiritual connectedness. More recent faiths have significantly altered these relationships, introducing the idea that we are in every way superior to other animals, and that, because of our innate superiority, we are justified in exploiting 'lesser' animals in any way we see fit. So the theme for my contribution to the camp is to be our spiritual relationships with animals. 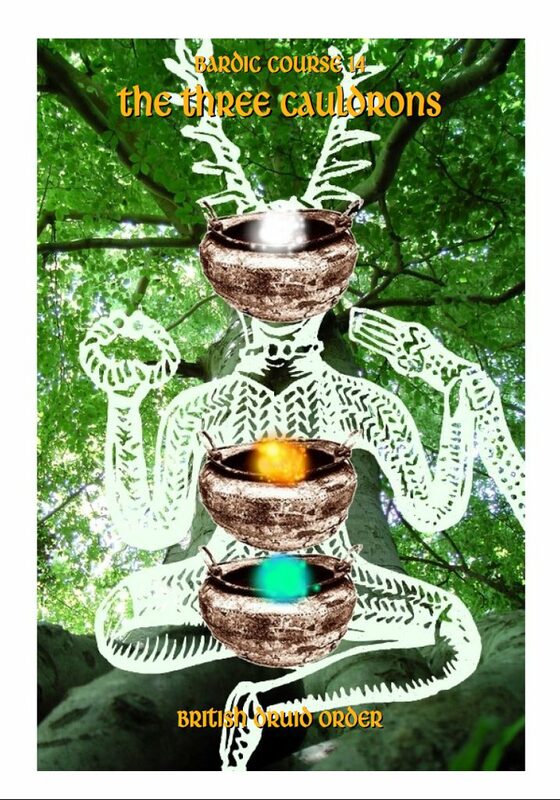 Antlered 'Lord of the Animals' figure from the Gundestrup Cauldron as portrayed in my Druid Tarot deck. The next question was how to make that work in the context of a Beltaine camp. I already had the vision of the roundhouse ceremony to work towards, so the question became how to get there. An obvious way in is to offer a talk on the spiritual links between humans and other animals and then, for those who want to explore those links more fully and deeply, to offer a spirit journey in search of spirit animals. Which begs the question, what do we mean by spirit animals? In 42 years as a Druid, I have found that most of us are accompanied by one or more spirit animals, of which one is usually dominant. They fulfil many roles, acting as guardians, guides and teachers, all of which come together in the word 'helpers.' They fulfil this role whether we are aware of their presence or not. Once we do become aware of them, we are obliged to interact with them more often and more deeply; the relationship becomes reciprocal, and we need to work to maintain it. For what our animal helpers give us, we take on the responsibility of keeping them strong and well nourished. We do this by entering into a new level of relationship with them. If you feel ready to take on this level of commitment, then connecting with your animal helpers can be an incredibly enriching experience. When I first encountered my wolf spirit brother, it completely altered my approach to my spirituality and, therefore, my life. 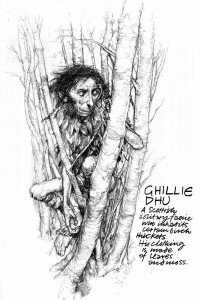 Ghillie Dhu, 'The Dark Lad,' a native British Birch tree spirits, by Brian Froud. The purpose of the ceremony is to cement our relationships with our spirit animals, encountered during last night's spirit journey if not before, and to explore ways in which we can strengthen and maintain them. Getting to the ceremony itself will require a certain amount of preparation. The roundhouse will need to be cleaned and arranged, and a plentiful supply of dry wood got in. Water, a large cooking pot and various other items will need carrying down. Then, on Sunday morning, I will need three or four people to help me in and around the roundhouse for the rest of the day. They will need to have frame drums and be able to play them well and keep good time. Ideally they should be fairly strongly connected with their own spirit animals. Our role from straight after morning meeting will be to prepare chaga. 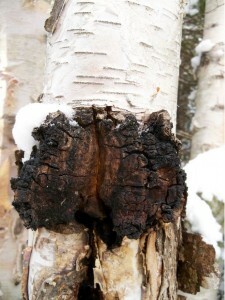 Chaga is a medicinal fungus that grows on Birch trees in Northern climes. It's most important effect is in strengthening the immune system, and it is widely used for this property throughout Eastern Europe and Asia. To prepare it for use in ceremony requires several hours. I should add that it is not hallucinogenic. The 'chaga crew' will have important roles during the ceremony. After lunch, folk planning on attending the roundhouse ceremony will need to prepare for it by creating their animal guises. One way to cement our relationship with our animal helpers is to dress ourselves as them. This can be achieved by wearing hides, masks, body painting, etc. As said, my vision had people entering the roundhouse naked apart from animal accoutrements and body paint. We have some water-based stage paints that can be used, but we will also have natural paints made from clay-based pigments dug at Wild Ways. Our idea is for everyone to get into their animal guises at (but not in) the roundhouse. You'll need to bring all your costume bits and a bag in which to store your clothes. You'll also need to bring a cup for chaga. You might also like to bring a cushion if you want to sit more comfortably in the roundhouse where the seats are logs or the hard earth floor. Once into your animal guise, you'll become your animal, roaming off into the woods and behaving as that animal. After a while, you'll be called back to the roundhouse. 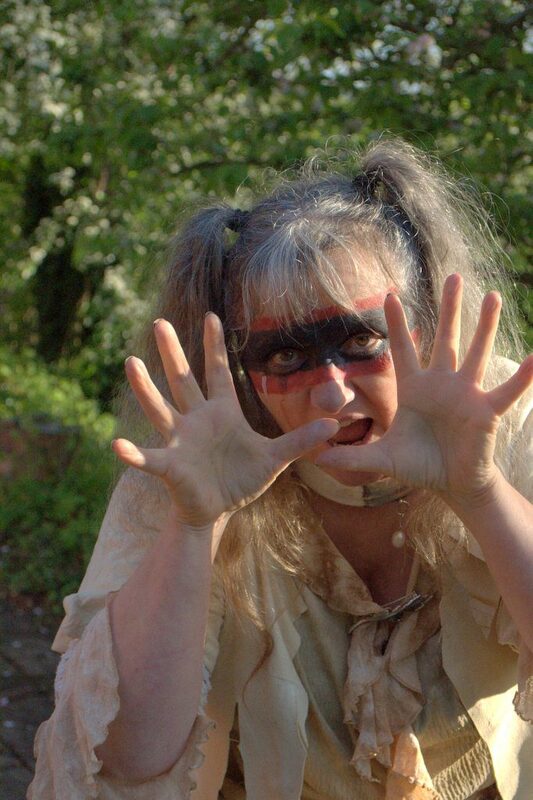 Staying 'in character,' you'll roam sunwise around the roundhouse making as much animal noise as you like. At an appropriate point, the doors will be flung open and you'll rush in, still in your animal form. This will be chaotic. That's fine. It's supposed to be. You'll then leave the roundhouse again, still in animal form. Once back outside, you'll 'humanise' yourself. Once the roundhouse is clear of everyone who isn't a member of the 'chaga crew,' two of the 'crew' will take up places on either side of the doors. Everyone else will pick up a cup and re-enter the roundhouse calmly (and walking upright! ), being blessed and sained on the way in by the two doorkeepers. Then take a seat and sip your chaga. There should be enough for two cups each. We will be in the roundhouse from around 4 pm to 6 pm. There will be about 50 people on the camp. We have previously managed 47 people in the roundhouse. It is quite tight, but it can be done. 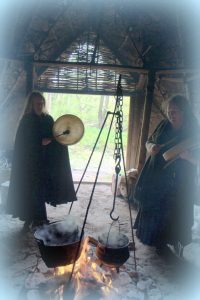 Sunday will continue with dinner followed by the Beltaine fire ceremony on the stone circle field. Author GreywolfPublished on June 23, 2015 March 17, 2018 8 Comments on Merry Midsummer! 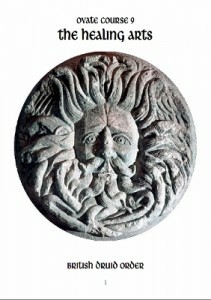 A similar ceremony is mentioned in the 4th century Acts of Saint Vincent as having taken place amongst pagans in Aquitane in southern France, who rolled their fiery wheel down a hill and into a river, from which they rescued the charred pieces to reassemble them in a temple to their sky god. 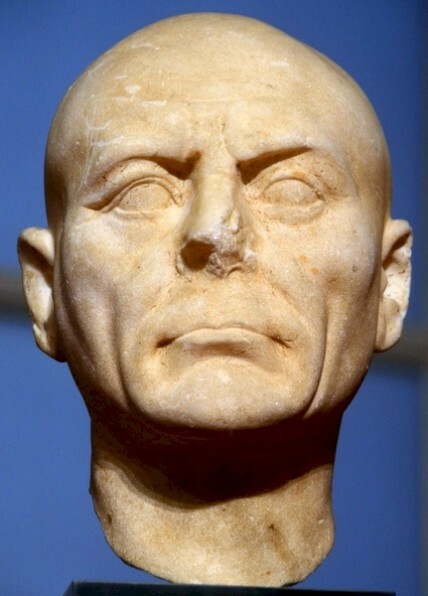 Why, then, do most modern Pagans celebrate midsummer on the day of the summer solstice and not, as our ancestors did, a few days later on June 23rd-24th? The answer is not hard to find. 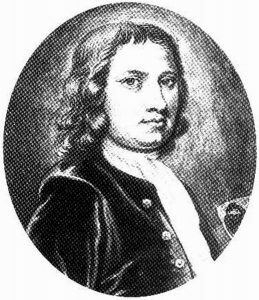 The idea of celebrating the summer solstice comes from William Stukeley, who associated Druids with Stonehenge and, in 1720, was the first writer to mention the solstice alignment of the Hele Stone with the centre of the circles there. 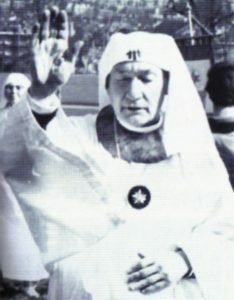 Iolo Morganwg, founder of the Gorsedd of Bards of Britain in 1792, visited Stonhenge and followed Stukeley in believing that Druids celebrated the solstice there. The same alignment was central to a book called 'Stonehenge and Other British Stone Monuments Astronomically Considered,' published by Sir Norman Lockyer in 1906. This book influenced the Ancient Druid Order, who started holding rituals at the henge a few years after its publication. 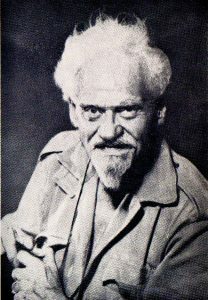 By the time Gerald Gardner and members of his coven were creating Wicca in the late 1940s, the idea of celebrating the solstices had become firmly fixed in the public imagination, and so the solstices became part of its festival wheel of the year. 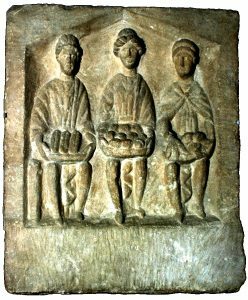 All of them either ignored, or were unaware of, the ancient and pan-European tradition of celebrating on the 24th. Why then, you may ask, is the Stonehenge Hele Stone aligned on the summer solstice sunrise, as is an avenue of stones at Callanish in the Orkneys and some of the stone rows at Carnac in Brittany? First, we may question whether the alignments actually are on the solstice or on Midsummer's Day. After all, it is the nature of solstices that the sun's rising position barely alters for about a week. Given the once pan-European custom of celebrating Midsummer's Day, by far the most likely explanation for the alignments is that they were designed to be watched in the run-up to midsummer, giving those who understood them time to spread the word that the festival day was approaching. Early agricultural communities were spread out over wide areas and travel was largely on foot. We know that people came to Stonehenge from all over southern England and as far afield as Switzerland. A decent amount of advance warning of festival dates was essential. Incidentally, it is currently fashionable to say that the major alignment at Stonehenge is not on the summer solstice sunrise, but on the midwinter sunset. While there can be no doubt that there is a midwinter alignment at Stonehenge, there is also, as Stukeley correctly surmised in the early 18th century, an extremely clear midsummer one. One does not cancel out the other. You may ask if it matters which day we celebrate midsummer or midwinter on? Personally, I think it does. Having been a Pagan for half a century or so, I've observed a lot. One of the things I've observed is that celebrating the solstices often causes problems. An obvious example is the amount of aggression that has often been associated with celebrations of the summer solstice at Stonehenge. In the early 20th century, the then head of the Ancient Druid Order became so incensed at being asked to pay sixpence to get in to the the henge that he uttered a long and angry curse on their owner. In the 1950s, the Ancient Order of Druids, who had been meeting at the henge annually since 1905, vowed never to do so again after loud, drunken hecklers climbed all over the stones during the AOD's solstice ceremony. In 1985, the police and soldiers in police uniforms smashed up vehicles attempting to get to the henge for the solstice, beating unarmed men, women and children in what became known as The Battle of the Beanfield. When I attempted to hold a ceremony for world peace at Avebury on the summer solstice of 1996, it was disrupted by angry drunks. 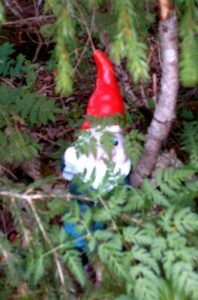 By contrast, those I've held on Midsummer's Day have been peaceful, joyous and focused. A kind of testosterone madness kicks in at the summer solstice which has dissipated by Midsummer's Day, a few days later, when the solar tide has turned. If we are truly attempting to restore, or at least be inspired by, the spirituality of our ancestors, then surely it makes sense to try and follow the ways in which they rode the cosmic tides. This is perhaps especially true of the solstices, the two annual festivals our ancestors regarded as vital, pivotal times of the year, times of magic and divination and of great power. When Emma Restall Orr and I founded the Gorsedd of Bards of Cor Gawr at Stonehenge in 1997, we made sure it would celebrate Midsummer's Day. This works out well, as a quiet, focused ceremony attended by no more than a hundred people restores a sense of peace to the place after the wildness of the solstice celebrations which attract many thousands. In Cornwall, the old tradition has been maintained, and a string of hilltop fires are kindled each year on Midsummer's Eve, June 23rd, just as the sun is setting. The accompanying ceremony is spoken in Cornish and climaxes with a Lady of the Flowers casting into the roaring flames a garland made up of good herbs, those believed to have medicinal qualities, along with bad herbs, those that are poisonous, and sprigs of oak, rowan and foxglove. I suppose rolling flaming wheels down hills would land us in trouble with Health and Safety regulations these days, but there's no reason why more of us shouldn't celebrate midsummer at Midsummer. Now here's a little treat for you for having read this far. 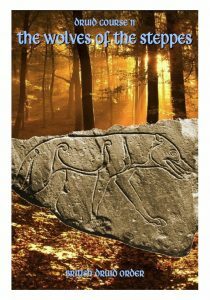 "Oh do not tell the priest of our rites, for he would call it a sin, for we've been out in the woods all night, a'conjuring summer in..."
Published on June 23, 2015 March 17, 2018 Categories British Druid Order, Druidry, Gorseddau, History, Ritual, Sacred SitesTags British Druid Order, Druidry, Festival, Gorsedd, Stonehenge8 Comments on Merry Midsummer! 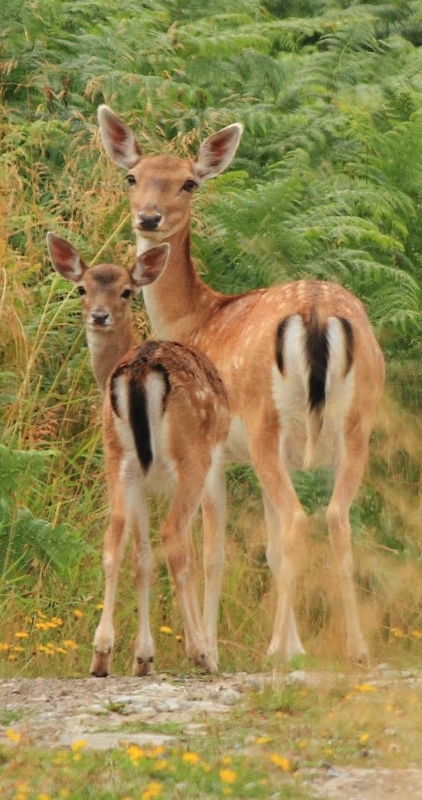 As my sons and I were walking up the hill out of our Wiltshire village, heading for the bus stop where my journey was to begin, a mother fallow deer and two young fawns emerged from the hedgerow and crossed the road a few yards ahead of us. I took this as a very propitious sign. 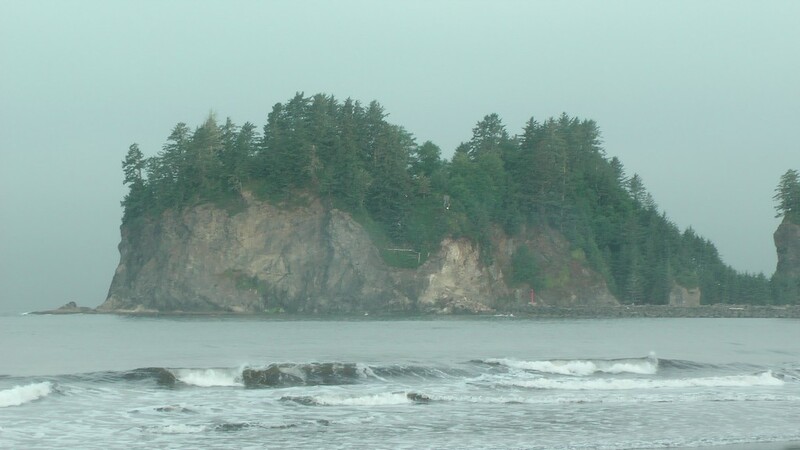 The ostensible purpose behind my trip was three-fold; to visit old friends in Seattle, to offer teaching in Druidry, and last but by no means least to spend time at La Push, home of the Quileute people out on the Pacific coast of the Olympic Peninsula. 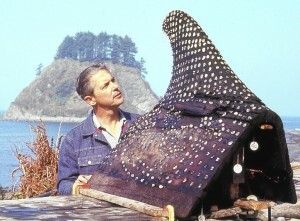 The Quileute connection began ten years ago, when my sons and I were made members of the drum circle at La Push following an extraordinary series of 'cosmic coincidences', not least of which involved one of the tribal elders having a vision of my coming five days before we arrived. All three purposes were achieved, but another soon became apparent: a dear friend had been diagnosed with cancer and was going into hospital for exploratory surgery shortly after our workshop weekend at La Push. An important part of my Seattle home from home is the Travelers Thali House Indian restaurant on Beacon Hill, run by my friends, Leon and Allen. Allen is an artist and an amazing cook who has spent time travelling around India gathering recipes, so the food at the Thali House is about the most authentic Indian dining you'll find outside of India. 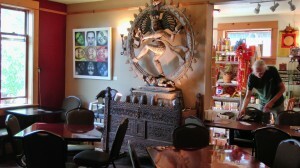 Allen's own art (that's his Goddess Yantra below left) and many beautiful Indian artefacts adorn the restaurant, adding to its relaxed, peaceful atmosphere. However, I only had a couple of days in Seattle before heading to LaPush for the first of the trip's workshops. 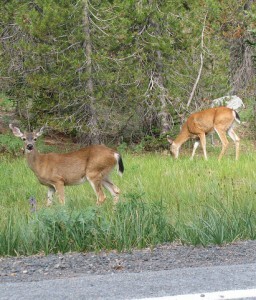 As we approached LaPush, we passed two black-tailed deer (below) grazing at the side of the road. Another propitious sign and another link between my Wiltshire home and the Olympic Peninsula. Our workshops being so far from the city and stretching over three days, we didn't bring a huge crowd with us, but one was provided for us by a surfing contest taking place over the same weekend all along the beach in front of the lodge building my friends had hired for us. This mostly ruled out moving any of our sessions onto the beach, though we did drum on the last evening as a brilliant moon created a path of light out across the Pacific to the far horizon. The talks and workshops went well, particularly a drum journey to find one's personal place of healing. My friend with cancer, who'd been feeling understandably rough for quite a while, was particularly blissed out by the journey, which was good. I also shared a system of healing I'd found in a medieval Irish manuscript. After the weekend, I stayed on at La Push in one of the little A-frame cabins, sharing it with a friend who was to drive us back to the city after the Wednesday evening potluck feast and drum circle at the Community Hall in the village. I'd brought along a new drum I made earlier this year, a big thunder-drum with an Ash hoop and Red Deer skin (left). 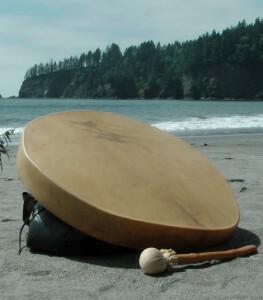 Previously, I've used a Remo Buffalo Drum with an artificial skin, bought on my previous trip to Seattle and first played in ritual with the Quileute Drum Circle. On Monday afternoon we walked along the beach and watched seals fishing close inshore. To my delight, they were joined by a small flock of my favourite Druid birds, cormorants. The beach ends in a narrow spit that juts out to the base of tall island stacks that lie just offshore. One of these is called A'ka'lat in the Quileute language, meaning 'top of the rock.' 8-9,000 years of tribal chiefs were lain to rest there in cedar canoes placed in the branches of the trees that cover the top of the island. 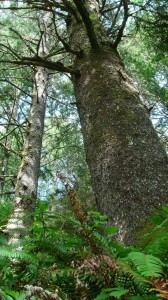 A'ka'lat (below) is a powerful spiritual focus of Quileute life. On Tuesday, my friend wanted to find a beach she'd last visited more than 30 years ago. 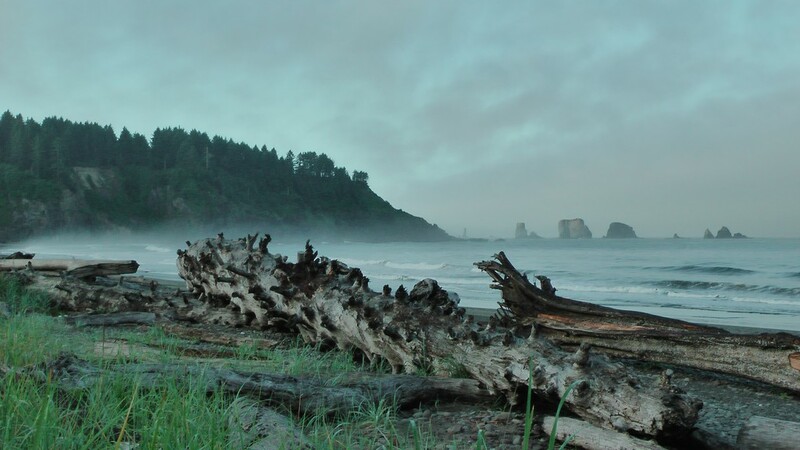 She recalled it being called Third Beach but decided that it wasn't the Third Beach just along from La Push but another, further North on the Makah reservation. So we set out in her car in search of a memory. We called in at the Makah Tribal Museum, a wonderful place, containing a full-scale replica of a Makah longhouse, based on those excavated at Lake Ozette in the 1970s. These had been remarkably well preserved due to the village having been swamped by a mudslide some 5 or 600 years ago. The picture (left) shows Richard Daugherty, who led the excavations and changed American archaeology forever by working on the site mainly with local Makah folk. He died earlier this year aged 91. The carved and decorated whale-fin in the picture is one of many objects from the excavations housed in the museum which is large, well laid out, and covers all aspects of tribal life, weaving, fishing, woodworking, decorative arts, myths and legends and much more. In common with other peoples of the Olympic Peninsula, the Makah hold the Orca (left) sacred and have legends of a Thunderbird who brings storms and of Raven as trickster and culture hero. They call the Orca the Sea-Wolf. 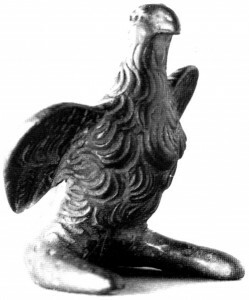 The first exhibit I came across, however, was devoted to the eagle and its role in tribal culture. This was interesting as I'd spent much of the drive thinking about eagles, a spirit bird with whom I've worked a lot in the UK. We drove on to the end of a trail that leads out to a clifftop perch that is the furthest Northwest tip of the United States, at least before you get to Alaska. The cliffs there have great caverns that pierce right through them. Just before we arrived, folk had been watching an Orca circling through these sea-caves. We drummed and sang, much to the delight of an 11 year old girl who sang along, and of her grandfather, who turned out to be a retired professor of environmental science and a really nice guy. No memory beach though. On Wednesday morning, we decided to try the Third Beach that's near La Push. It turned out to be the one. My friend remembered the trees as being huge. However, a sizeable part of the tribe's income is derived from logging, so most of the big trees had been felled and the area replanted since her previous visit. There were, however, some big stumps left, some still several feet tall. We followed the long path down to the beach. During the walk, I felt a sense of sadness from the earth for what had been lost through the long years when the government had banned the Quileute from speaking their own language or conducting their sacred ceremonies. This, however, was overlaid with a sense of returning power and growing strength. I felt that this stems from the tribe's renewal of traditional ceremonies through the Drum Circle, and through other renewed traditions, like that of holding an annual canoe journey along the coast in company with other coastal tribes. This was revived in 1997 and has grown larger each year since. Long ago, K'wati, the Transformer, changed wolves into humans to create the first members of the Quileute tribe. He told them their descendants would always be brave and strong because they were descended from wolves. He was right. In the late 19th century, the government told the Quileute to move to a reservation on the land of their Quinault neighbours. They refused and stayed in their own village. They're still there. Some years later, a white settler burnt down most of their houses while the villagers were away working. They rebuilt. The photograph (left) dates from around 1900 and shows members of the tribe on the beach at LaPush dealing with a fish catch. In the early 20th century, the tribe were denied their fishing rights, removing both an important source of income and a primary source of food. 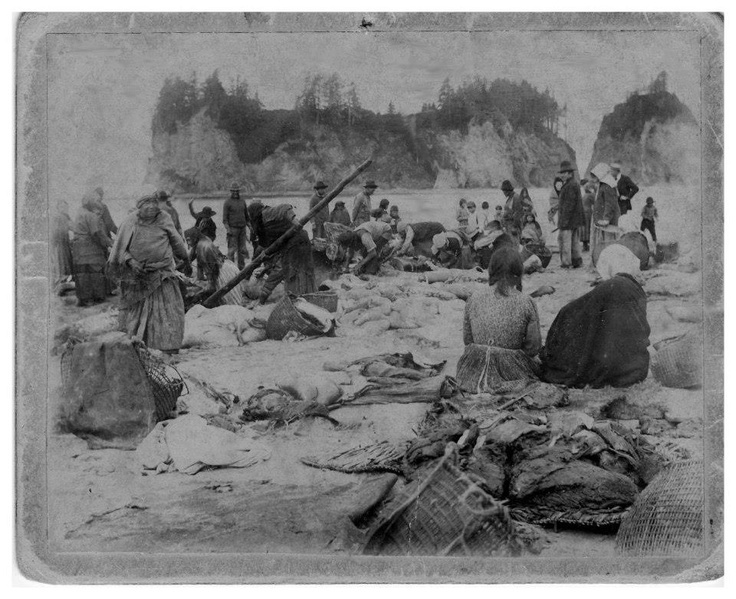 In the worst of times, Quileute numbers fell to below 50. Now, there are around 750 Quileute, they have regained their fishing rights, built a tribal school in which their language is being taught, have seen tourist numbers and the resulting revenue increase tenfold in the last ten years and have been given back an area of their original tribal land on which to rebuild their public buildings inland, away from the coastal tsunami zone. 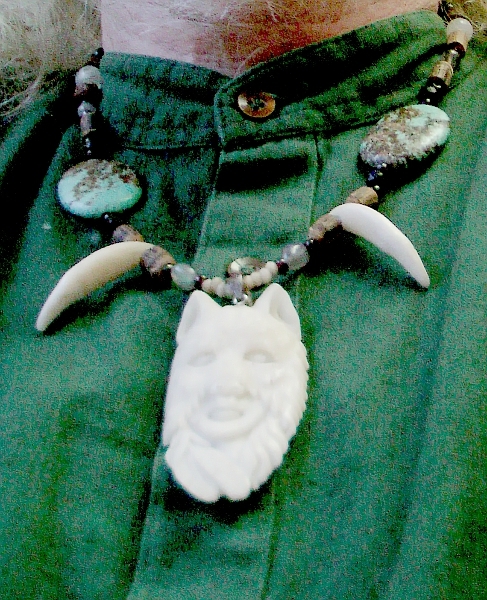 My friend, Leon Reed , Seattle's longest-serving Wiccan Elder and Druid priest, had suggested I bring with me to La Push a wolf-skin he'd been given many years ago. It's a single hide of what must have been a huge grey wolf. It's now moulting, though the leather is still in very good shape. Since we'd been on the coast, I'd envisioned myself drumming whilst wearing this wolfskin, but it had never felt right to do so on First Beach at La Push. Third Beach turned out to be the place of my vision, so I fastened the hide across my shoulders, picked up my drum and walked to the shoreline where waves were breaking across the sand. It had been misty, cool and damp for the previous couple of days so my drum had absorbed moisture and not been at its best. A minute of holding it up to the bright sun and blue skies that greeted us on Third Beach was enough to bring back its voice and it sang for me. As the drum sang, so I began to sing with it, wordless sounds that expressed and evoked a powerful, joyous energy rising up in me. There was something so right about being there and doing what I was doing. Eventually, realising that time was passing, I drummed and sang a farewell song to the spirits of the place. Again, it consisted of whatever sounds or words came to me and whatever rhythm seemed right. This is often the way. Songs come for whatever your intention is, stay long enough to do what they are needed to do and then float away on the wind, perhaps never to be heard again in this world, or maybe to come back as and when they're needed. That time on Third Beach was beautiful, soul-nourishing and filled with power and magic. It will long stay with me. The feast was laid out on trestle tables near the kitchen and consisted of two big trays full of fresh cooked salmon, a big cauldron of beef stew, a range of vegetables and bread. There was plenty to go around. Soon two lines of trestle tables filled up with villagers and visitors sharing this rich feast. We sat opposite a mother whose 12-year-old daughter was a huge Twilight fan. In case you've missed the Twilight phenomenon, it began as a series of books written by Stephanie Meyer and burgeoned into a series of incredibly successful films. 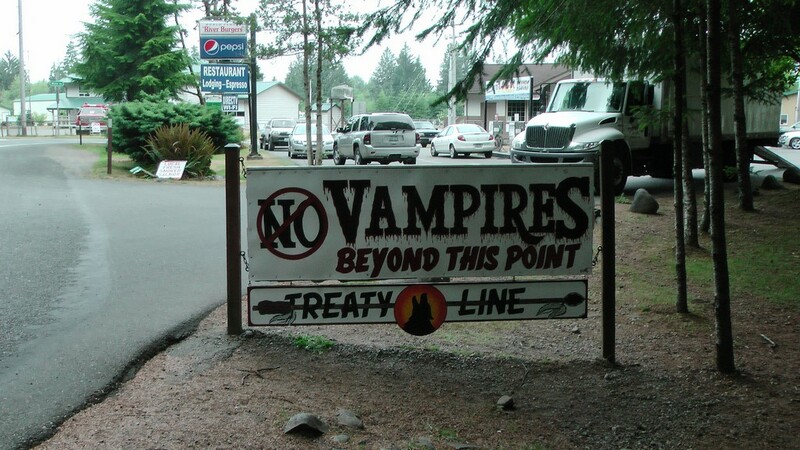 Apparently Meyer wanted to set a vampire novel in the wettest part of the United States and a google search revealed that to be the town of Forks, located on the Olympic Peninsula not far from the Quileute reservation. She noticed the presence of the village of La Push and then found the Quileute sacred legend of their descent from shape-shifting wolves. She therefore decided to portray the young males of La Push as werewolves. As far as I can discover, she has offered the Quileute nothing from the millions she's earned from this bastardisation of their sacred history and nor has the film company. The Burke Museum in Seattle hosts an excellent site that looks at the reality of Quileute life as compared to their Twilight portrayal. The tribe has seen some benefits as Twilight-related tourism has swollen tribal coffers and created some new jobs. Native American actors from the films have lent the weight of celebrity to local causes. Twilight's huge popularity amongst children has helped pressure politicians into acceding to the tribe's request for the return of some of their land. This road sign greets visitors. Ten years later, much had changed. There was no Potlatch giving ceremony apart from three youngsters who had birthdays who sat on chairs in the middle of the dance circle and were given small gifts, mostly dollars. The dance circle now is painted on the floor of the Hall, marked with the four directions. Chairs were placed in a circle around it, where before they'd just been pushed back against the walls. Before the dances began, three men of the Drum Circle led songs in rich, vibrant baritone voices that filled the hall with powerful waves of sound. The format was for one of the three to begin, then for others who knew the song to join in. The Drum Circle then gathered in a corner of the Hall next to the gap between chairs that formed the entrance to the dance floor. The drummers were mostly younger than I remembered. 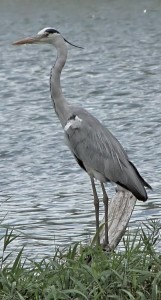 I joined them, as did a handful of other non-Native folk. The only comment to me from a member of the Circle was “Big drum.” Being a drummer, you naturally take a keen interest in everyone else's drums. These were a varied group, some clearly hand-made, several small Remo drums whose artificial hides are not prone to changes of tone in the same way that natural hides are, a real bonus in a climate as wet and cool as that of the Northwest Pacific coast. Some were painted, others not. Of the painted ones, the ones that registered most strongly with me was painted with an image of T'ist'ilal, the Thunderbird (left). Then we started. Again, the format was for one of the three lead singers to start a song and for others to join in after the first round. Drumming was carried out the same way, the lead singer starting to drum, the rest of us joining in after a few beats and following his rhythm. I had my back to the dance circle, focused on following the lead drummer. The rhythms were powerful, strong, the varied voices of the drums blending well together. A shortish, thin guy in the corner was one of the three lead singers and had a big Remo drum. It was he who'd commented on mine. He smiled a lot, laughed a fair bit, had a great singing voice and did a good deal of the leading of both songs and drumming for the first part of the evening. The songs were very different this time. Gone were the cowboy songs that had formed part of the repertoire a decade earlier, replaced with a more structured programme of local, traditional songs. The dances too were more formal. After the first few songs and dances, dancers wearing traditional masks appeared among us. 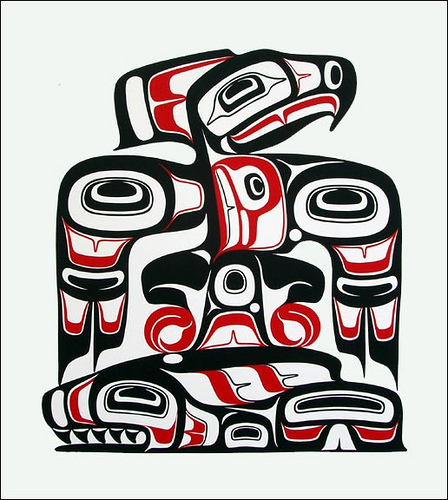 Some masks were of wood, others of thick card, each painted with a character from Quileute sacred history, powerful spirit beings such as Thunderbird (T'ist'ilal), Wolf (K'wali) and Orca (K'wal'la, literally 'Wolf of the Ocean'). Photography is not allowed during the ceremony. 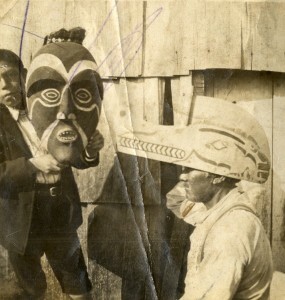 The picture here, taken around 1905, shows two Quileute men with carved wooden dance masks. There were, if memory serves, six masked dancers, the youngest of whom seemed about nine years old, the oldest perhaps early twenties. The young boy showed a focus I've rarely seen in one so young. They took the lead in the next group of dances while we drummed and sang for them. The power in the hall and amongst the drummers and dancers seemed to ramp up several notches. When the masked dancers arrived, the grey-haired man who had earlier commented on my T-shirt came and drummed beside me. 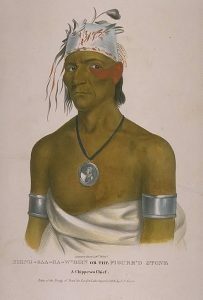 He wore a traditional hat of woven cedar-bark and a red blanket around his shoulders. The dancers wore similar colourful blankets which flew out around them as they danced. 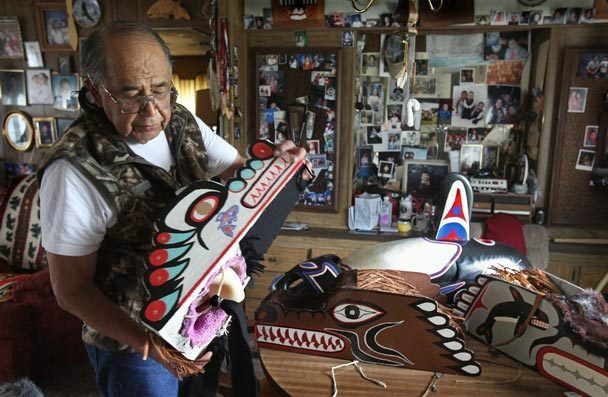 The next image shows Quileute mask-maker, Roger Jackson, with some of the dance masks he's made. Another of the three main singers took the lead for the masked dances, a big guy with a lined face, dressed in blue. He handed over his drum and used a fan of dark feathers to beat out time. When a dance was coming to an end, he inverted the feathers and beat downwards with them until the stop. These stops came suddenly and I admit to missing a couple of them and throwing in an extra beat after everybody else. I'm reminded of a piece of liturgy I've found in several places, from ancient Greece to modern America. Basically, it asks the gods and ancestors to forgive us for our mistakes in sacred ceremonies. Mostly though, I stopped along with the rest. The use of the feathers really helped a novice like me, unfamiliar with the songs, giving a clear visual focus. Our role was not only to drum and sing for the dances themselves, but also to drum fresh energy into the masked dancers between them. When each dance came to an end, they would file out from the dance circle and hunker down on the floor in the middle of our little group of drummers. We would then abandon rhythm, close in around them, and just drum powerfully and fast to raise power for the dancers. This was also amazingly powerful for us, renewing our own energy to drum and sing for the next dance. I was being terribly English and taking a respectful step back each time the dancers rejoined us until one of the dancers waved me back in to the knot of drummers. From them on I made sure I leaned in close with the others. As said, photography is not allowed during these ceremonies. 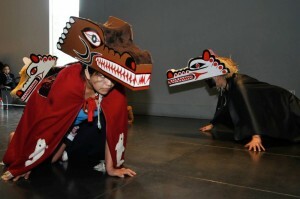 The wolf-masked dancers here were photographed in 2011 at a public event, the Northwest Native Community Celebration. After the masked dances, there were a few more songs and less formal dances. The evening ended with a light-hearted exchange between the male drummers and singers and a party of female dancers. This took the form of a mock singing contest in which the women would sing a verse while the men pretended to be straining to hear them and made comments to each other like, “Do you hear something? Nope, me neither.” Then the men would sing a verse, sometimes wandering over to the group of women and making a cheeky comment, to which the women would respond either with a similarly cheeky comment or by bopping the miscreant on the head with a plastic water-bottle or whatever else came to hand. It was very funny. Afterwards, we all drifted out into the night. I feel honoured to have had this opportunity to be a part of such a powerful ceremony. The Quileute are the People of the Wolf and, as such, I think of them as brothers and sisters. On Saturday we made a sun-blessed ceremony with the Gorsedd of Bards of Caer Pugetia (aka Bards of Turtle Island) in a Seattle Park. 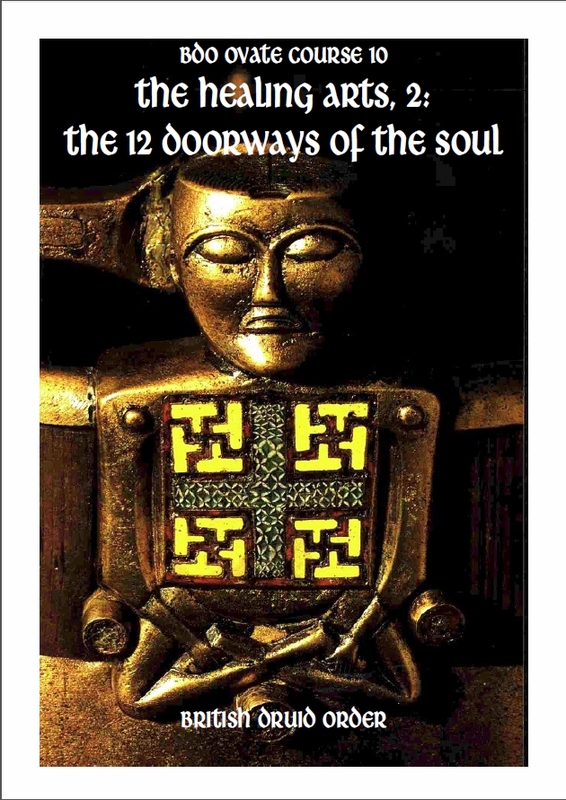 On Sunday I conducted a workshop on the '12 Doorways of the Soul' healing technique that features in the British Druid Order ovate course. This took place at the Seattle healing practice of my friend, Amy, who I'd shared the technique with earlier in the week. It was a very successful session and I've accredited Amy as a practitioner of the technique. She's since used it with clients with great success. Amy, a Reiki practitioner for many years, was kind enough to pass on comments from a regular client who told her that the 12 Doorways technique seemed much more potent than Reiki. Incidentally, in case anyone's wondering, I am not a Wannabee Indian. 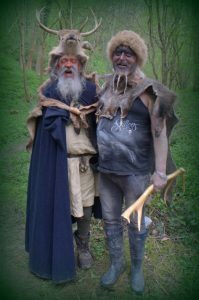 I'm an English Druid, have been for forty years and will continue to be so 'til my last breath. I do, however, greatly enjoy sharing ceremonies with folk of other cultures, whether that be joining ceremonies in LaPush or welcoming Lakota or Australian Aboriginal visitors to Druid ceremonies at stone circles in the UK. I am always delighted to find how much we have in common. Through honouring and learning to work with our own ancestors and the spirits of our own land, we open our hearts, minds and spirits to others who do the same in other lands. Spirit workers from many traditions I've communicated with over the years agree that if humanity is to be steered away from its current path of destruction, it will be the spirit workers of the world who bring it about. Shifting consciousness is, after all, a basis of our art and a shift in conscousness is what's required to open humanity to a better path. This won't be easy, but by sharing ceremonies, knowledge and understanding, we strengthen and support each other in the difficult task that faces us. My friend with cancer has had some good news. Following chemotherapy and good vibes flowing in from around the world (he's very well liked), the tumour has shrunk and medics are discussing whether they need it to shrink further or whether they can operate to remove it without another course of chemo. This latest trip to the Pacific Northwest was a remarkable one, as each previous one has been. There is undoubtedly a powerful link between my sons and myself and the land and people of this distant region, the two-legged, the four-legged, the feathered and the finned. It's a great mystery how I allowed ten years to pass between visits and I shall strongly endeavour not to let so much time elapse before the next. You may have noticed that I have a bit of a thing about animals. As a child, I had an instinctive understanding that they were a special breed of people. I suspect this is an extremely common human experience. After all, traditional stories told to children around the world are full of talking animals, animal helpers, teachers and guides, and animal transformations. In my book, Druidry: A Practical and Inspirational Guide (Piatkus, 2000), I wrote of an experience at a Druid camp of swapping consciousnesses with an eagle and soaring high above the world on powerful wings. I've also written of the sweat lodge in which I first encountered the spirit wolf who was to become such a central part of my life and from whom I draw the craft name, Greywolf. He and I have also traded spirits so that I perceive the world through his eyes and he through mine. In other circumstances, when called for, I have become a serpent or a dolphin. These experiences of becoming other-than-human are well described in Whitman's poem, famously quoted by Lord Summerisle as played by Christopher Lee in the film, The Wicker Man. I share Whitman's sense of animals having a different, much clearer, less encumbered engagement with life than we humans with our tangled webs of guilts and fears. They perceive clearly what needs to be done and go about doing it in the most efficient way possible. We, on the other hand, often fail to act, held back by worry about possible consequences. While in many cases this is clearly a good thing, we often take it to extremes where we are paralysed from taking any action at all, even when circumstances demand it. The results of inaction then often add to our worry and frustration, erode away our sense of self-worth, and can lead to severe psychological imbalance. Becoming animal breaks us free of this destructive cycle by allowing us a clearer perspective, enabling us to see what is really important and to discard the rest. This has been proven to me time and again. Things that have angered and frustrated me as a human and which I have felt unable or unwilling to address have often melted into insignificance when I have become wolf or eagle. Either that or, in animal form, the right and only course of action to pursue has become crystal clear and my animal self has had the strength and courage to follow it through. In shape-shifting, the physical perspective alters, so that as an eagle you see fields and houses way below and have a clear, unbroken view to the far horizon, while as a wolf, your visual perspective is much nearer the ground while your sense of smell and hearing are hugely enhanced. However, it is not just the physical perspective that shifts. Inhabiting the body of an animal, seeing through its eyes, experiencing the world through its other senses, also changes how we feel about the world and our place in it. As Whitman says, animals “do not sweat and whine about their condition, They do not lie awake in the dark and weep for their sins.” For us as humans, this psychological shift is profound, freeing us from doubt, fear and all the other stifling emotions that prevent us from achieving clarity and acting decisively on it. The importance of this gift cannot be over-stressed. 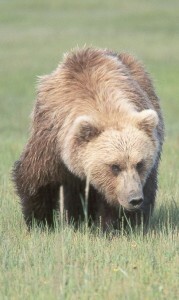 In my experience, we all have spirit animals who protect and guide us. At least, I've only ever encountered one person who didn't. He was a long-term drug addict whose physical and mental state had deteriorated to such an extent that no spirit animal had felt able to remain with him. It is my belief that we do not choose which spirit animals we have, but that they choose us, drawn to us by who we are, how we think and what we do. When these things change, one set of spirit animals may leave us and another take their place. With me the major transition was from solitary heron as a child to pack animal wolf as an adult. How we discover our spirit animal guardians, guides and helpers varies from person to person and place to place. They may be encountered in vivid dreams or spontaneous or deliberately sought for visions, or may emerge simply through a deep fascination with one particular species. Having discovered one's 'power animal', what happens next? In my case, the discovery of 'my' wolf was quickly followed by the acquisition of a wolf-skin cloak, wolf stories and images, a wolf tooth and a wolf chant. The chant as originally given to me in the 1990s originated with the Seneca people of North America. However, it immediately transformed into a native British wolf chant very different from the Seneca original. I posted it on youtube a while ago. 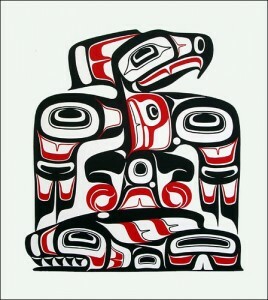 Having studied other cultures and shared ceremonies with indigenous peoples including the Quileute ('Wolf People') and Makah tribes of the Olympic Peninsula in the Pacific Northwest U.S.A., I know that such animal spirit songs and chants are common around the world. In Britain and Northern Europe, they have been largely lost to the erosion of history and in particular to the onset of Christianity. Early Christian edicts specifically outlaw dressing up as, and acting like, animals. In spite of this, animal-like costumes are still worn as part of folk festivals across much of Europe. 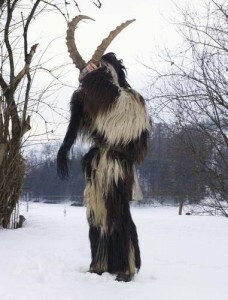 Charles Fréger has photographed several such costumes in a series called Wilder Mann. While some of these folk figures may have traditional songs that accompany their appearance, as does the Padstow 'Obby 'Oss in Cornwall, they have no doubt changed considerably over the years under the influence of a hostile church. Having been given the two chants featured here, it struck me as a good idea to try and restore a set of spirit animal power songs to our native tradition. The wolf and deer chants represent a beginning and other chants will be added as they come. I've worked with eagle quite a lot, so have high hopes there. My son, Joe, has strong bear magic, so I hope we can come up with a good bear chant. I already have a serpent chant, though not yet recorded. The plan is to establish a collection of songs and chants relating to some of our most prominent native (or formerly native) species and to put them out on CD. In the meantime, I'll post them on youtub e and facebook as and when they emerge and I have time to record them. I'd appreciate your help. If you work with an animal spirit and have a song or chant that you use to help maintain your link with that animal, please record it (however roughly), post it (letting me know where), and we'll polish it up, re-record it if necessary, and add it to the collection. When the CD comes out you will, of course, be fully credited. Having no idea how much interest in this project there might be, I'm unable to make any estimate as to what, if any, royalties might flow from it. To be honest, that's not my concern. The intention is simply to restore or re-create another, potentially very powerful, aspect of our native spiritual tradition and to share it with those who might find it useful in making, enhancing and maintaining their own relationships with the spirit animals who have so much to teach us and share with us.